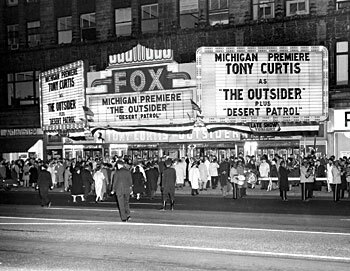 Fox Theatre: The Detroit Fox Theatre is the largest surviving movie palace of the opulent 1920s. It was listed on the National Register of Historic Places in 1985 and was designated a National Historic Landmark in 1989. Stroh's: In 1848, during the German Revolution, Bernhard Stroh, immigrated to the United States and established his own brewery in Detroit in 1850. 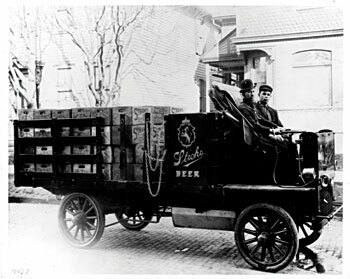 Though the brand was acquired by Milwaukee based Pabst Brewery in 1999, Stroh's continues to be synonymous with Detroit. Vernors: Before the Civil War began, James Vernor, a Detroit pharmacist, concocted a drink made from19 different ingredients. 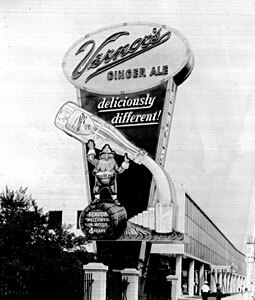 For years, the only place one could buy Vernors was from the fountain in James Vernor's pharmacy at 233 Woodward Ave. in downtown Detroit. However, demand for the drink continued to grow and soda fountains throughout the city began to sell cold, carbonated Vernors. 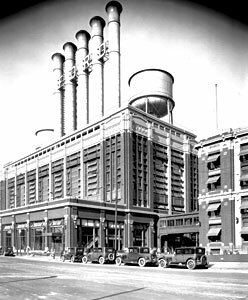 Ford: Ford was launched in a converted factory in 1903 with $28,000 from twelve investors, most notably John and Horace Dodge, who would later found the Dodge Brothers Motor Vehicle Company. Ford continued to grow into one of the most powerful and profitable companies in the world. Belle Isle: Frederick Law Olmsfeld, a prominent urban park designer who also designed New York City's Central Park, landscaped Belle Isle in the 1880s. 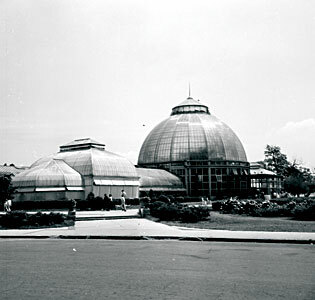 Belle Isle is the largest island park in the U.S. and continues to be a popular recreational destination for Detroiters. Hitsville/Motown/Barry Gordy: In 1959, Barry Gordy founded Tamla records with an $800 loan from his family. 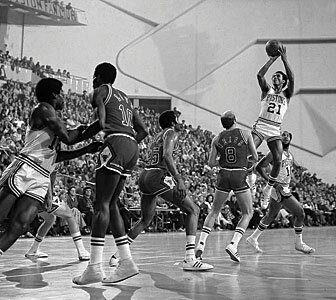 Tamla signed acts such as The Miracles with lead singer Smokey Robinson. Later in the same year, Gordy purchased the house that would become Hitsville, USA. The photography studio in the back of the house was converted into a small recording studio. In September of 1959, Gordy founded his second label and called it Motown Records. 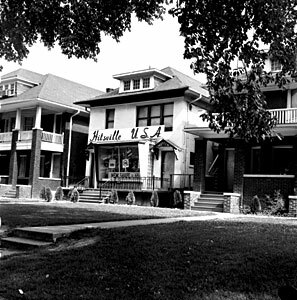 In 1985, the Hitsville, USA building was re-opened as the Motown Historical Museum dedicated to the legacy of the record label, its artists and its music. Hudson's: Joseph Lowthian Hudson, an immigrant from England, opened a haberdashery in the Detroit opera house in 1881. In 1911, Hudson's moved to an 8-story building on Woodward Ave. Gradually, as Hudson's grew, they bought up real estate around their store in order to build large additions. In 1924, Hudson's sponsored the first Thanksgiving Parade, which rivaled New York's Macy's Parade as the nation's favorite. DIA: The Detroit Institute of Arts has one of the largest, most significant art collections in the United States. 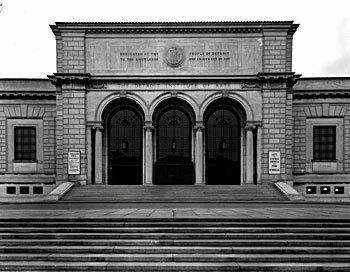 The current Beaux-Arts, Italian Renaissance styled building was dedicated on October 7, 1927. The frescos by Diego Rivera were later added to what had been a courtyard. The frescos were not well-received in the beginning; however they're considered great works of art today. 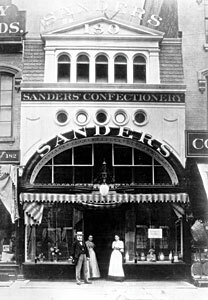 Sanders: Sanders Confectionary was first opened by Fred Sanders on June 17, 1875 and started with a single retail shop in Downtown Detroit. Over the years the company concentrated on expanding its retail stores and eventually built up to over 57 stores in the Metropolitan Detroit area. 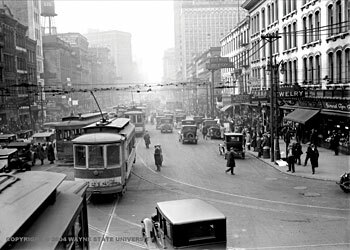 Woodward/Merchants Row: Named for Augustus B. Woodward, the man responsible for planning Detroit's layout after the fire of 1805, Woodward Ave. is Detroit's most famous street. 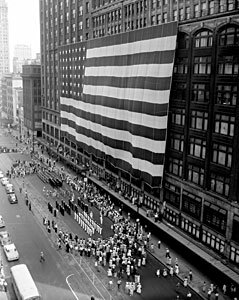 Leading directly into the heart of downtown Detroit, several retailers, including Vernors, Sanders, Winkleman's, S.S. Kresge Co., F.W. Woolworth Company and Hudson's had locations on Woodward in an area that became known as Merchants Row. Faygo: Ben and Perry Feigenson founded Feigenson Brothers Bottling Works in 1907. 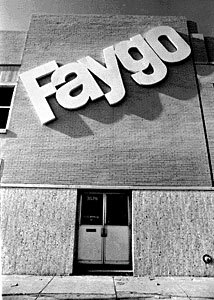 The name was later changed to Faygo because it was easier to print on a bottle. The original flavors (Fruit Punch, Strawberry and Grape) were based on cake frosting recipes used by the Feigensons at their bakery in Russia. Faygo flavors are regularly featured on "Best Of" lists and Faygo is certainly one of the most loved brands in Detroit. 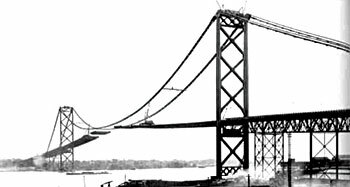 Ambassador Bridge: When it was completed in 1929, The Ambassador Bridge was the longest suspension bridge in the world. It is the only privately owned border crossing between the U.S. and Canada and the busiest international border crossing in North America. 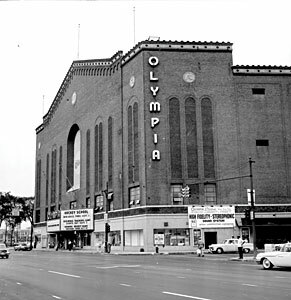 Olympia: Nicknamed "The Old Red Barn," Olympia Stadium stood at 5920 Grand River Ave. from 1927 until 1987. Shortly after opening, Olympia became the home of The Detroit Red Wings. 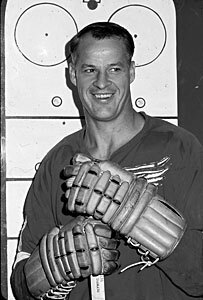 In the 1950s, hockey fans packed the 15,000-seat stadium to watch Gordie Howe and the "Production Line" win four Stanley Cups. The Penobscot Building: Since 1905, the world of business has revolved around Detroit’s internationally recognized landmark, the Penobscot Building. Decorative pavers lead pedestrians to the Building’s imposing four-story entrance archway on Griswold Street. Sweeping bronze and glass revolving doors open to the impressive lobby. The Building’s one-of-a-kind decorative friezes and carvings have been carefully preserved. Many of these museum-quality decorations, sculptured in granite, recall the Penobscot Indians for whom the structure is named. 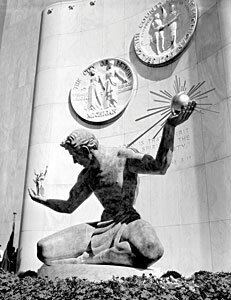 Spirit of Detroit: The monument was sculpted by Marshall Fredericks and dedicated to the city in 1958. The statue was never actually named, however Fredericks used a verse from the Bible (2 Corinthians 3:17): "Now the Lord is the Spirit: and where the Spirit of the Lord is, there is liberty." Gradually people began calling it "Spirit of Detroit." Art Deco Architecture/Detroit Skyline/Penobscot Building/Guardian Building: Detroit is home to some of the grandest art deco architecture, and the Penobscot is a shining example. The building was named for the Penobscot, a Native American tribe, because Native American styled art deco ornamentation is used on the exterior and interior. 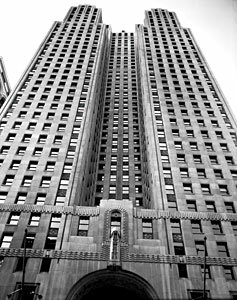 Designed by leading Detroit architect, Wirt C. Rowland, the Penobscot became the eighth tallest building in the world and the tallest of any building located outside of New York or Chicago when it was completed in 1928. Bob-Lo/Bob-lo Boat: Detroit's answer to New York's Coney Island, Bob-lo Island amusement park opened in 1898 and featured several attractions. 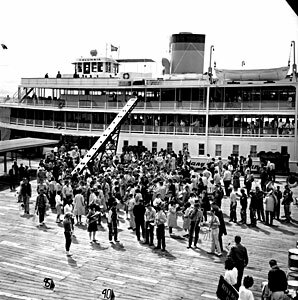 However, the most popular and famous attractions were not the rides at the park, but the steamer boats that transported park goers from Detroit - the S.S. Columbia and the S.S. Ste. Claire, affectionately referred to as The Bob-Lo Boats. 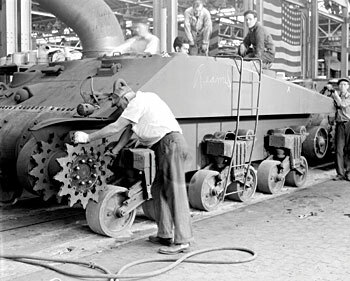 Military MFG: When the United States entered World War II, Detroit quickly became the epicenter of wartime production. The Guardian building was converted into a control center for war production. All of the city's heavy industry had been channeled into military production. 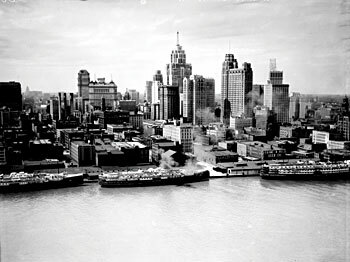 Nicknamed "The Arsenal of Democracy" by President Theodore Roosevelt, Detroit was the most productive and important city in the country. 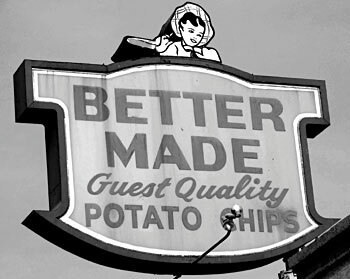 Better Made: In 1934, Cross Moceri and Peter Cipriano launched their first and only potato chip brand, Better Made. In 1955, the company moved to their current location on the eastside of Detroit near Eastern Market. With a focus on quality ingredients, Better Made has been manufacturing potato chips for nearly 80 years. 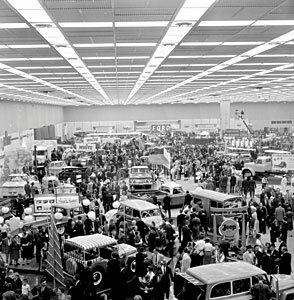 Auto Show: While other cities host auto shows, the North American International Auto Show, held annually in Detroit, is by far the most significant. The first Detroit Area Dealer Association Auto Show was held in 1907 at Riverview Park. The show has grown from a regional event with 17 exhibitors to an international event with more than 60 exhibitors. 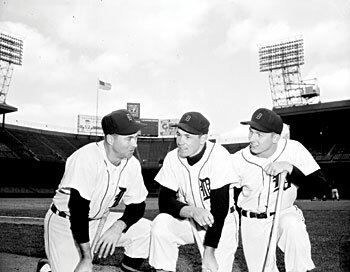 Tigers/Lions/Red Wings/Pistons: Detroit is often considered one of the greatest sports cities in America with a presence in all four professional leagues. 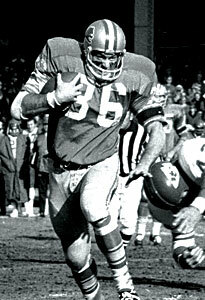 All of the Detroit's teams have a storied history with 22 league titles between them. Detroit has the fourth most championships of any U.S. city behind New York, Boston and Chicago. 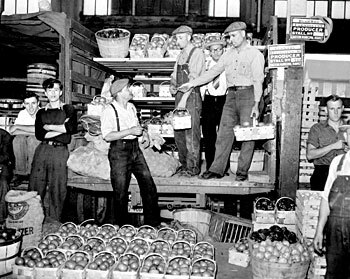 Eastern Market: The Farmer's Market in Detroit was first opened in 1841 at Cadillac Square. In the beginning, the east side market was devoted to the sale of hay and wood, but in 1891 sales sheds were built and the Farmer's Market was moved from Cadillac Square to its present location and renamed Eastern Market. Today it is the largest historic public market district in the United States. 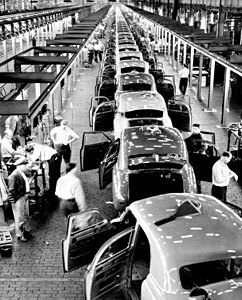 Assembly line: Henry Ford was the first to implement the idea of an assembly line to large scale automobile production at the Ford Piquette Plant in Detroit, increasing output, lowering costs and making his Model T accessible to America's middle class and forever changing the way we live our daily lives.